Next generation blood collection monitor with interactive multicolor LCD display. Helps technicians to follow the SOP”™s ensuring standardization of the collection process. Contoured for better spine support, increases donor comfort & safety. Natural feet high position increases blood flow, supports donation process. REMI Walk in chambers are designed for simulating, monitoring & control of environmental conditions like temperature & humidity. Centrifuge Bucket Equalizer (CBZ-50 Plus) is a Micro-processor controlled device specially designed to equalize the counter-facing buckets of centrifuge simultaneously. REMI Dry hot air oven ” RDHO series are specially designed to achieve extreme dryness by evaporating all moisture contents from the biomass or other material. REMI heating incubators -RHI series are suitable for achieving precise incubation temperature of different laboratory samples required for optimizing reaction sensitivity. The Digital Microplate Shaker is an essential instrument for mixing individual micro plates of different type. iny footprint-as small as the plate itself. MBT 100 is a refrigerated mobile transport box for easy & safe transfer of temperature sensitive biological products. It provides active temperature control. 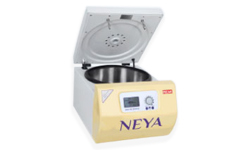 Derived from the Hindi word “NAYA” which means “new”, “novelty”, “innovation”, “NEYA” is the name given to the new generation of centrifuges recently developed by REMI. REMI Neye is designed considering the specific requirements of medical laboratories. Precise control of all run parameters help in efficient results for sensitive diagnostic tests…. Flabo X – The Premium Phlebotomy Chair. REMI premium phlebotomy chair FlaboX is ergonomically designed, allowing patient’s correct posture during phlebotomy. REMI Plasma Freezer are designed to meet the storage requirements of Plasma. Durable, corrosion resistant materials are used to provide years of reliable performance. REMI Thawing bath offer quick and optimum thawing of plasma at required temperature levels. Available in two variants Refrigerated & Non-Refrigerated. Hemodialysis Chair / Chemotherapy Chair / Therapeutic Chairs, the innovative design of the Dzire 3X Therapeutic Chair underlines the high quality Standards. REMI Bench top sealer WeldOn-B is designed to meet high standards in blood safety. WeldOn-B helps to keep the blood bag system completely sterile. REMI’s new range of ultra-low deep freezer is specially designed for faster temperature pull down & optimized cryopreservation. Highly sensitive microprocessor..
REMI Water Bath Series is multipurpose water bath with adjustable double line six holes to hold different size samples for easy & hygienic heating.